Perhaps the most famous way to usher in the New Year in the world is by attending the New Year's Eve ball drop in Times Square in New York City. The ball is a year-round Times Square attraction. As the ball drops from One Times Square beginning at 11:59 p.m. on New Year's Eve, there are normally more than one million people in Times Square, not to mention the 100 million people watching the ball drop nationwide, and even more people watching from around the world. Once the ball drops, 1 ton of confetti flurries down, blanketing Times Square and New Years' revelers. To attend the ball drop is free; there are no tickets needed to watch the event in Times Square. A few tips include getting there several hours in advance of midnight and strategizing where you will have a bathroom break. You should plan a few things in advance, like dressing warmly in layers and having food while you wait for midnight. People have been celebrating New Year's Eve in Times Square since 1904, but the first ball drop did not happen until 1907. Since 1907, the ball has been dropped from One Times Square every year, except in 1942 and 1943 due to wartime restrictions on lighting in New York City. The event was first organized by Adolph Ochs, owner of The New York Times, as a successor to a series of New Year's Eve fireworks displays he held at the building to promote its status as the new headquarters of the newspaper. The first ball was designed by Artkraft Strauss. 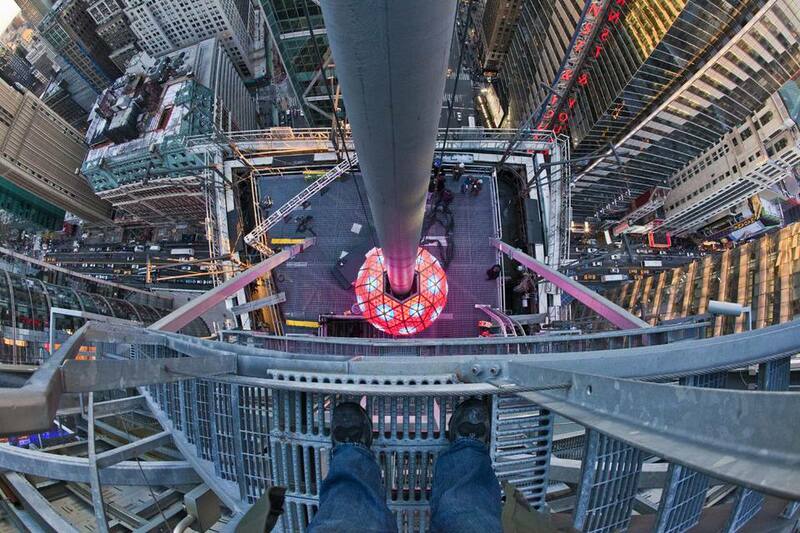 There have been several balls dropped from One Times Square over the years. In 2008, a 12-foot, nearly 12,000-pound geodesic sphere, double the size of previous balls was introduced. There are many parties and events held at Times Square area restaurants, bars, and hotels. If you want to have a view of the ball drop, be sure that the venue you choose actually offers that—some just allow you to leave the venue and handle the Times Square crowds on your own in order to get a live view of the ball drop. Clarify with the venue to be sure whether you will be indoors or not. Reservations and advance purchase tickets at these venues are almost always required for New Year's Eve events. Expect that there may be security checkpoints that require tickets or special authorization for you to get to restricted areas that get closed off as the evening progresses. As you can imagine, one million people exiting an area at once can be troublesome. Be prepared for it to take a while to get out of the area. The crowds and traffic can make getting anywhere a bit difficult. Patience and knowing what to expect can make the whole experience much better.